Donald Trump said she has done a “fantastic job”. NIKKI HALEY HAS resigned as the US Ambassador to the United Nations, in the latest departure from President Donald Trump’s often shifting national security team. Meeting Haley in the Oval Office, Trump said she has done a “fantastic job” and would stay on until the end of the year. “She told me probably six months ago, ‘I want to take a little time off’,” Trump told reporters. A successor will be named “in the next two or three weeks”, he said. However, Haley was coy on her reasons for quitting, saying only that it was “important to understand when it’s time to stand aside” after a string of challenging jobs. US media reports quoted administration officials saying privately that Haley’s departure was a surprise even to Secretary of State Mike Pompeo. In a statement to journalists at the White House that lasted a few seconds, Pompeo called her a “great partner”. He then refused to take questions. US media speculated that Haley has ambitions for running against Trump in the primaries ahead of the 2020 elections, where she might be seen as a more moderate Republican alternative to his turbulent and often divisive presidency. But she quashed the rumour. “No, I’m not running,” she said. Trump and Haley went out of their way at the Oval Office meeting to emphasise that the resignation was taking place on amicable terms — something far from always the case in the turbulent first two years of the administration. But while Washington insiders questioned whether Haley’s departure signalled a new round of palace intrigue, a more prosaic explanation for the move was that she needs to earn a serious private sector salary. Indeed, her 2018 government ethics financial disclosure shows her with huge debt, including a mortgage worth more than $1 million (about €870,000). 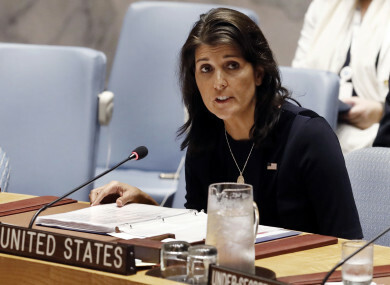 A former governor of South Carolina, Haley took the UN job with little experience in foreign policy but quickly became a voice for the often unpopular Trump agenda. Haley has pressed for a hard line on Iran, justified US cuts to foreign assistance and earlier this year led the United States in bolting from the UN Human Rights Council, accusing it of bias against Washington and close ally Israel. However, there was embarrassment at the international diplomatic get-together when the audience in the hall burst into laughter during Trump’s keynote speech, where he claimed that his government had achieved more in two years than “almost any other administration in the history of our country”. The daughter of Indian immigrants, Haley had long been seen as a rising star in the Republican Party, which has eagerly sought female and ethnic minorities to broaden the appeal beyond its traditional white demographic. Haley, whose given name was Nimrata Randhawa, was elected governor in 2010 of deeply Republican South Carolina and during the 2016 campaign had criticised Trump over his remarks on immigrants before their political reconciliation. She was praised by UN Secretary-General Antonio Guterres, who spoke of his “deep appreciation”. But for Stephen Pomper, US programme director at the International Crisis Group, Haley’s successes have to be weighed against her record as a “divisive force, attacking institutions and NGOs that serve transparency and basic rights”. “She will leave the US role in the United Nations weaker than she found it,” Pomper said. Haley is the latest official to resign from a turbulent White House, where Trump is already on his third national security adviser and second secretary of state before even the midterm elections. She insisted that she was going out on a high and would remain loyal to Trump. “Countries may not like what we do but they respect what we do,” she said, echoing the president’s often-stated aim to make the US a more muscular presence on the international stage. She listed hawkish policies to pressure Iran and the Palestinians, and the groundbreaking diplomatic outreach to North Korea. “All of those things have made a huge difference in the US standing, but I can tell you that the US is strong again. The US is strong in a way it should make all Americans proud,” Haley said. Despite the many positive reviews for Haley in Washington, the group Citizens for Responsibility and Ethics in Washington on Monday urged an investigation into her use of private planes and accepting of basketball tickets as gifts. Email “Nikki Haley, US Ambassador to the UN, resigns”. Feedback on “Nikki Haley, US Ambassador to the UN, resigns”.